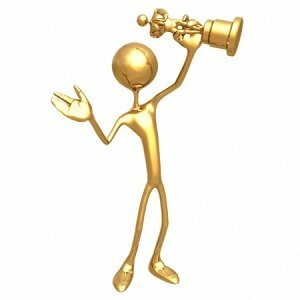 An award ceremony speech is a type of public performance that is claimed on the occasion of a rewarding ceremony. Depending on the event and the type of acknowledgment, the content of the speech may vary from showing appreciation for the award simply saying, “I’m happy to hold this award in my hands” to giving thanks to all who have contributed to gaining a particular award. Meanwhile, it definitely encompasses the following components: an introduction that must be short, obvious, and positive, the main body that may involve dedications and commemorations, as well as award acceptances, and a short conclusion. Ultimately, all successful award ceremony speeches have one important thing in common: they regard the event from the triumphant perspective, and the best ones are prepared ahead of time. 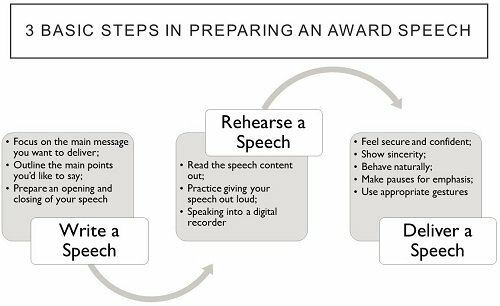 So wondering, “How to make my award ceremony speech stand out?” Follow our guide where you’ll find some useful tips on the issue. Before you start reading this article and applying all the tips presented in it, look at the introductory part of an award ceremony speech presented below crafted for a ‘Teacher of the Year Awards’ ceremony. Good evening to everyone! It is a big pleasure to share this night with all of you here. The Teacher of the Year Awards Ceremony is a traditional event that takes place annually in our school. Thanks to the benevolent support from the Parental Club, the awards over the last 20 years are found widely recognized and warmly saluted by winners. In this anniversary year, the Awards are separated into three categories, distinguishing teachers that have not only achieved an academic recognition but also helped their students to gain advanced results. Among our winners, there are teachers who run the most successful student projects and arrange the most effective charity activities. All the finalists being here were selected during the strict tentative rounds grounded on a range of all-around evaluation criteria. Regardless of their majors and spheres of interests, these individuals have something essential in common – they love their job and do their best to serve the society, and thus these teachers are truly the role models for the young generation. Our thankfulness goes to all teachers for their strong efforts and support in promoting the complex personal development of the young people here, in preparing them for a future career, and mostly, in upbringing their young personalities with a faithful mind and open heart. Also, I would like to admit the hard and honest work of our professional and experienced judges. Their activity was lasting for months and helped to make the difficult selection between “the best of the best.” Due to this painstaking work, I have the honor of congratulating all the winners of the ‘Teacher of the Year’ with their advanced achievements and outstanding personal development. I am sure that every one of you will be progressing in the future and thus contribute to the common well-being of the whole community. Always keep in your mind that your student looks at you with great expectations and hope to gain a perfect mentor and a faithful friend. My sincere thankfulness goes to the Municipal Committee and the Santa-Martina Volunteer Club for arranging such a great and outstanding event. I believe the ‘Teacher of the Year Awards’ ceremony will keep being an opportunity to honor the prominent achievements of our teachers in the next years. Conclusively, I want to wish all of you a happy and fortunate coming year. What Makes an Award Speech Ceremony Attractive? It is a good idea to put this question before taking on a speech itself. To answer the question, “What will make my award speech attractive?”, you’re highly recommended to watch the video of the best Oscar speeches ever. Look at how the famous people speak in public when they are awarded. Elaborate preparations for public speaking. It means that even if you’re going to an award ceremony without guessing that you’ll be awarded, you should be ready to say some words. Believe Leonardo Dicaprio was likely to prepare a speech every ceremony he attended. Eventually, he got a coveted prize and manage to give a good speech. Follow his example! And in any case, good verbal communication skills in public might not go amiss. Asked to make a speech at a friend’s wedding or the birthday party? Do it well by practicing regularly! Develop active listening, confidence, emotional intelligence, and an effective body language to feel better during the public speaking on any occasion. Sincerity. No amount of preparation can influence an audience’s perception greatly if you as a speaker are insincere in your speech, especially when it comes to an award ceremony speech. It may concern any emotion, feeling or impulse before your thought processes turn them into words. Tears well up? Don’t be afraid of showing them! Imagine that you’re speaking to a close friend and your sincerity will be appreciated by the audience. Naturalness. Despite demonstrating sincerity, it is important to be quite natural in public speaking. You shouldn’t be too emotional if this state of mind isn’t typical for you. Don’t start crying purposely just because thinking, “The audience needs to see me sincere during my award ceremony speech.” Behave naturally! Feeling shy or perplexed? Don’t try to change yourself in this very minute. However, you should find a nerve to go up to a stage and deliver a good speech. Try out! Believe you can make the best award speech ever? Well, you are left to take some basic steps in doing it – create a speech, rehearse it, and deliver it in front of the audience. Let’s prepare your award speech together! Focus on the main idea of an award speech. If you’re asked to give a speech at the award ceremony, the first step is to choose a focused message. Determine if you want to show appreciation for the award and thank people who helped you or describe your path to getting an award and why it is vital for you. Even if you are given a prize, your speech shouldn’t miss a source of inspiration or motivation for the others to achieve the same great results in the field, be it a movie industry or science. This is more a general umbrella under which your main points should fall in your award ceremony speech. Make a short list of 5 ideas for your speech. Know why the particular number of ideas to think of is used? Firstly, let’s look at the numerological meaning of 5 – it expresses the sense of personal freedom with a quick-thinking wit. Secondly, there is a consistent pattern with sets of 5. How many elements in the world? Right, 5 world elements – earth, air, fire, water, and spirit. How many senses do we have? Right, 5 senses – sight, taste, touch, hearing, and smell. You still have 5 ideas of your award speech to provide. Think of what you’d like to say about in your award speech. Choose 3 supporting subpoints to the main points. With the main focus on the subject of speaking, you should support your words. You aren’t offered to plunge headlong into the numerology by finding out why 3 supporting details are needed. Just list them for your detailed speech. When you finish the outline of your speech, you can conclude it’s quite long to say about 5 points with 3 subpoints within 3-5 minutes. That’s why you can shorten it by removing some details. It is much more convenient to make speech content shorter than longer by picking out of the nose. What details are essential? Any evidence from your life that brings you to success. For example, your mom always says you, “Never give up!” Tell about it by giving the colorful description. Think of storytelling for your award acceptance speaking. Unfortunately, all that we can do for you is to help with speech writing to get an award with dignity. It rests with you to practice your speech in front of the mirror or with the help of a recorder and deliver it effectively in the audience. Remember to be sincere and natural during your award speech! Besides, never give up for hell’s sake to get the award of recognition in this big world even if you struggle with a lot of written assignments now!